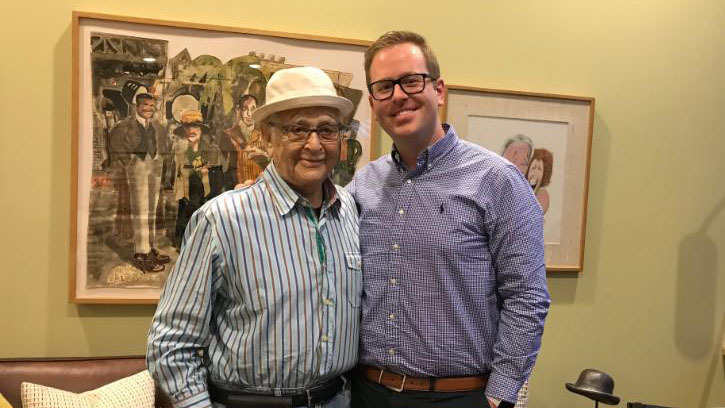 Last month, Dr. Taylor Cole Miller headed to the west coast to film a one-on-one interview with Norman Lear, a TV icon and nonagenarian. Lear is the legendary creator of the 1970s’ biggest shows including All in the Family, The Jeffersons, Sanford and Son, and Maude. The two sat down at Lear’s Beverly Hills production office and discussed some of his lesser-known shows (Mary Hartman, Mary Hartman and All That Glitters) as well as his current projects, One Day at a Time for Netflix and Guess Who Died for NBC. The interview will be featured in a documentary Taylor is currently producing on the history of sexual nonconformity in American television. If you want to see him in action but can’t wait for the documentary, read more or check out a clip of the interview in this recent Grady news release.